Temperature Scale Inserts. The inserts fit Uniweld's patented gauge cases. 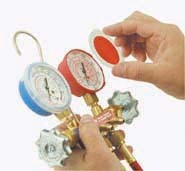 Inserts are available for most refrigerants. pouch that's color coded for high and low side.